I am quite behind on accepting a few awards this blog has received over the last few months. Rest assured this has in no way been because I am ungrateful; it brings a smile to my face each and every time a reader goes out of their way to let me know they enjoy my work, especially when I know my updates can be erratic and few and far between recently, as I’ve been dealing with not only my chronic migraine condition, but also plantar fasciitis in my left foot, and with pain on both ends of my body, finding the time and energy to put into Sim writing has been hard. It is extremely humbling to have readers willing to stick with me during these difficult times that appreciate my work, despite the slow updates. Thank you so much! 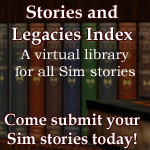 This nomination came from Sweetnightingale over at Simming with Sweetnightingale, a new site with Sims 3 short stories, which is great if you want to sit down and curl up with a short, one-shot tale you can quickly read in a single sitting. There are currently two short stories available, and both have supernatural overtones, making them great choices for fans of supernatural romances or dramas! Expect more in the future! Thank you so much, Sweetnightingale, CathyTea, and Twiggy! I really appreciate it! 2. Share the award on your blog. I’m fairly certain that most of my readers already know certain facts about me, as I am pretty open about them in my writing (that I’m a librarian, that I am diagnosed with chronic migraine, that I’m an aromantic asexual, etc.) so I’m really going to try to pick things that I think I’ve never mentioned before. And if I have… oops. Well, I tried! 1. I was born on St. Patrick’s Day at 11:57 pm (just barely made the holiday!) with Spinal Menangitus and had to receive spinal taps as an infant. 2. I can touch my nose using my tongue. 4. I have a problem with “mushy” food textures, as they set off my gag reflex. Applesauce, pudding, pretty much any Italian food because it’s covered in heavy goopy sauces, etc., are all problematic for me! And my most hated food of all? Bananas! 5. Things I have way too much of but can’t stop myself from getting more: LUSH bath products, looseleaf tea (mainly herbals and rooibos but I drink greens and blacks on rare occassions depending on how they are flavored, I’m careful about my caffeine intake! ), and gel pens for coloring! A perfect evening for me? A soak in the tub with some LUSH shower gel or a bath bomb, followed by a hot cup of tea while I put on a Twitch stream and listen while I color a mandala with my gel pens! This is my main way of “unwinding” after a day of work. 6. I don’t get television service. I own a TV which a DVD player and a few retro game systems are connected to, but it gets turned on probably less than five times a year (and that may be grossly over-estimating). It has no antenna and doesn’t even receive local channels! There are a few TV shows I follow but I watch them online; the majority of my “TV watching” time is instead spent on YouTube shows and watching Twitch streamers! 7. It would probably shock most people to discover that according to Pottermore, I am a member of house Slytherin! Less surprising, however, is that my Patronus is a Wildcat. As per usual, most of the sites I follow regularly have already received a nomination for this award by now, and I certainly don’t expect anyone to have to alter their acceptance posts, so please don’t on my account! 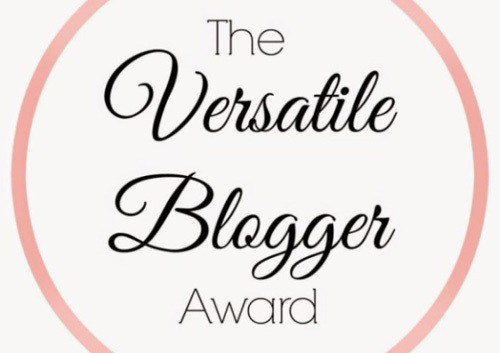 These are all Sim story sites that I think fit the theme of the Versatile Blogger Award by either having a lot of versatility in the content on their site or the characters in their stories. Please check them out! I can touch my nose with my tongue , too! And I would have guessed Slytherin ! Yandere Diaries ? Lol! My birth was chaotic too , the classical double cord around the neck and about tv I do agree with you , there is only a few quite interesting shows to watch, but the whole rest is pure garbage and intellectual masturbation if I may speak like this. I’m really glad for you! Congratulations!